Few structures in America combine architectural ingenuity, economic necessity, and romantic idealism better than the covered bridge. Covered bridges flourished in the United States in the 19th century. Vermont, with about 104 of them, has the highest density of bridges. 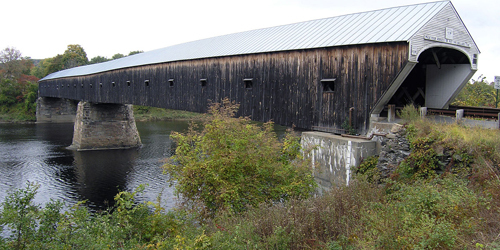 Vermont and New Hampshire share the Cornish-Windsor Bridge, the longest wooden covered bridge in the United States. Individual inventiveness played an important role in the proliferation of covered bridges. As the industry grew, builders experimented and adapted each other’s designs in hopes of building stronger bridges with the fewest materials. Covered bridges grew in popularity in the early 20th century and became subjects for artists and advertisers. Location: 0.5 miles west of the junction Route 12 on US4, then 0.1 miles right on River Road. 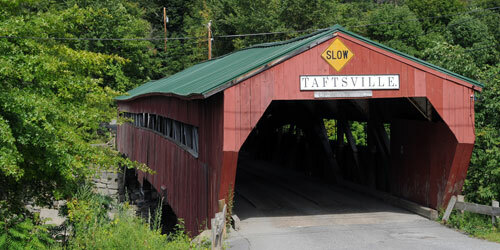 The Taftsville Bridge, built in 1836 and one of the oldest covered bridges in Vermont, carries River Road the over Ottauquechee River. Two-span multiple kingpost truss with an arch; 189 feet long; spans are 89 and 100 feet. The Middle Bridge, rebuilt in 1969 by Milton Graton, carries Union Street over the Ottauquechee River. Town lattice truss; 139 feet long. Parking in the village along US4. 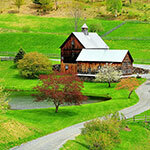 Location: Travel 0.7 miles north of junction Route 125 on Route 23; then 0.5 miles right on Horse Road; and just right. The Pulp Mill Bridge, finished in 1820, carries Pulp Mill Bridge Road over Otter Creek. Barrel Burr arch; 195 feet long. Parking available beyond bridge, and turn right. Location: E. of Route 100 on Bridge Street. This bridge, built in 1833 and restored in 1975, is the oldest operating covered bridge in the state. It carries Bridge Street across the Mad River. The basic structure of the Great Eddy remains intact, but much of the flooring and braces were replaced in the 1970s. A pedestrian walkway, an original component that had been removed, also was rebuilt in the 1970s. The bridge has the longest clear span of any Burr truss bridge in Vermont. Multi-kingpost and Burr arch; 105 feet long. Parking available on village streets with a short walk to the bridge. Location: About 2 miles south of the junction of US7 at Pittsford Mills on Route 3 then right on Gorham Bridge Road a half mile to the bridge. The Gorham or Goodnough Bridge, built in 1841, carries Gorham Bridge Road over the Otter Creek. Town lattice truss; 114 feet long. Parking in pulloff near bridge. Location: Off Route 22A. Travel 2.7 miles north of junction Route 73 east on Route 30; then 2.8 miles east on Shoreham-Whiting Road; 0.7 miles on west side of road. The East Shoreham Railroad Bridge, built in 1897, carries an abandoned rail line over Lemon Fair River. Howe truss; 108 feet long. Parking in lot near bridge also used by fishermen. This is a state-owned historic site. Location: W. off Route 7. Travel 2.2 miles of the junction of Route 3 at Pittsford Mills on Route 7 past Pittsford then left 0.8 mile and just right to the bridge. The Hammond Bridge, built in 1843, carries Kendall Hill Road over the Otter Creek, but it is closed to vehicular traffic. During the Flood of 1927, the bridge floated more than a mile down Otter Creek. It was undamaged, and was towed back to his site on a barge of empty barrels. Town lattice truss; 145 feet long. Parking in pulloff near bridge. Location: E. next to Route 110. Travel 2.5 miles south of junction Route 113 on Route 110, then 0.1 miles left on Moxley Road. The Moxley Bridge, built in 1883, carries Moxley Road over the First Branch of the White River in Chelsea. Queenpost truss; 59 feet long. Parking is available on either side of the bridge along the shoulder. Location: S. next to Route 4. Travel 3.1 miles west of junction Route 106 on US4; then left on Fletcher Hill Road. Visible from US4. The Lincoln Bridge, built in 1865, carries Fletcher Hill Road over Ottauquechee River. This is a one-of-a-kind modified Pratt truss with an arch; 136 feet long. Location: 1.3 miles NW of the junction of Route 3 on US7 in Pittsford then left a half mile then left 0.3 miles on Depot Road. The Depot Bridge, built in 1840, carries Depot Road over the Otter Creek. Town lattice; 121 feet long. Parking in pulloff near bridge. Location: W. next to Route 14. Travel 0.4 miles north of Windsor County line on Route 14, then just left on Kingsbury Road. 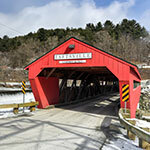 The Kingsbury Bridge was built in about 1904 and is one of the newest of the historic covered bridges in Vermont. It carries Kingsbury Road over the Second Branch of the White River in South Randolph. Multiple kingpost truss; 46 feet long. Parking available on the Route 14 side of the bridge. Location: E. off Route 110. Travel 1.0 miles northeast of Tunbridge Village center on Route 110, then 0.1 miles right on Larkin Road. The Larkin Bridge, built in 1902, carries Larkin Road over the First Branch of the White River. Multiple kingpost truss; 66 feet long. Parking available beyond the bridge. Location: E. off Route 5. Travel 0.4 mile north of the junction I-91 on US5; then 0.6 miles right on Martinsville Road. The Martins Mill or Martinsville Bridge, built in 1881, carries Martinsville Road over the Lulls Brook. Town lattice truss; 135 feet long. Parking to the right before crossing the bridge. Location: E. off Route 30. Travel 3.2 miles south of junction of Route 74 on Route 30; then 1.3 miles left on Swamp Road. The Cornwall-Salisbury Bridge is also known by the names Station Bridge, Creek Road Bridge, Cedar Swamp Bridge, and Salisbury Station Bridge. This one-lane bridge, built in 1865, carries Creek Road in Salisbury and Swamp Road in Cornwall over Otter Creek. Town lattice truss; 153 feet long. Parking in small lot near bridge. Location: Off Route 12 on Slaughter House Road, formerly Bailey Street. The turnoff is 0.3 miles south of the main intersection in Northfield Falls, then 0.1 miles down Slaughter House Road to the bridge. The Slaughter House Bridge, built about 1872, carries Slaughter House Road over the Dog River. Slaughter House Road was formerly named Bailey Road. Queenpost truss; 55 feet long. A small parking area is available on the left side of Slaughter House Road before crossing the bridge. Location: E. off Route 110. Travel 3.2 miles south of junction Route 113 and Chelsea; then 0.1 miles left on Bicknell Hill Road. The Flint Bridge, built in 1845, carries Bicknell Hill Road over the First Branch of the White River. Multiple kingpost truss; 87 feet long. Parking on either side of the bridge. The Willard Bridge, built in 1870, carries Mill Road over the Ottauquechee River. Town lattice truss; 128 feet long. Parking to the right before crossing the bridge. Location: 3.9 miles north of junction Route 22A on west side of US7. The Spade Farm Bridge crosses a farm pond and is used only for foot traffic. A sign on the bridge says it was built in 1824; some experts believe it was probably built in the 1850s. Town lattice truss; 85 feet long. Parking nearby in lot for Spade Farm. Location: E. off Route 100. From Village Bridge travel east on Bridge Street to Waitsfield Commons. Take a left on North Road; 1.2 miles to the bridge. The Pine Brook Bridge, built in 1872, carries North Road over Pine Brook just outside Waitsfield. Its structure has never been altered and it is open to public use. Kingpost truss; 48 feet long. Parking available on the north side of North Road. Location: S. off Route 7 in Brandon off Pearl Street extension. The Sanderson Bridge, built in 1838, carries Pearl Street extension over the Otter Creek. Town lattice; 132 feet long. This bridge is no longer open to traffic. A steel bridge directly next to the Sanderson Bridge carries the traffic on Pearl Street. Parking in pulloff near bridge. This bridge was built in 2001, a short distance down the Mill Road from the Willard Bridge. Town lattice truss; 80 feet long. Parking available to right before crossing the bridge. Location: East off Route 7. Travel 0.1 miles southeast of junction of Route 30 on US7; then 1.3 miles left on Washington Street; then 1.6 miles left on Halpin Road; 0.3 miles right on dead-end road. The Halpin Bridge, built in 1824, carries Halpin Road over Muddy Branch of the New Haven River. Town lattice truss; 66 feet long. Parking available on west side of the bridge. Location: E. of Route 100 on Warren Village Road. The Warren Bridge, a prominent symbol of the Town of Warren, was built in 1880, and it carries Warren Village Road over the Mad River in Warren. Unique features of this structure are the different portal openings at either end of the bridge. Queenpost truss; 59 feet long. Parking available along Covered Bridge Road. Location: SW. off Route 103. Travel 0.2 miles east of the junction of US7B on Route 103 then right 1.2 miles on Airport Road and right again on River Road; then left on East Road 0.1 miles to the bridge. The Kingsley Bridge, built in 1838, carries Congdon Road over Mill River. Town lattice truss; 135 feet long. A mill is located adjacent to the bridge a short distance downstream. Parking in pulloff near bridge. Location: N. next to Route 106. The Baltimore Bridge, built in 1870, was originally located in North Springfield. It was moved to its present location near the Eureka Schoolhouse in 1970. 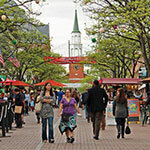 Town lattice truss; 37 feet long. This is a state-owned historic site. Location: W. off Route 12 on Cox Brook Road. The turnoff is to the west, at the main intersection in Northfield Falls, then 0.1 miles down Cox Brook Road to the bridge. The Station Bridge, built about 1872, carries Cox Brook Road over the Dog River. This is the only location where one historic covered bridge in Vermont can been seen from another; from the Station Bridge you can see Lower Bridge, which is just down the road. This bridge is also known as the Northfield Falls and First Bridge. Town lattice truss; 138 feet long. Good parking area near Second Bridge down Cox Brook Road a short distance. Location: E. next to Route 110. Travel 1.1 miles north Windsor County line on Route 110; then just right on Belknap Brook (Hill) Road. The Howe Bridge, built in 1879, carries Bellnap Brook Road (also known as Hill Road) over the First Branch of the White River in South Tunbridge. Multiple kingpost truss; 75 feet long. Location: S. off route 131. Travel 0.3 miles west of junction of Route 106 on Route 44; then 0.1 miles left on Upper Falls Road. The Downers or Upper Falls Bridge, built in about 1840 and restored in 1975-76, carries Upper Falls Road over the Black River in Amsden. Town lattice truss; 120 feet long. Roadside parking. This bridge, built in 1851, crosses the Winooski River (formerly known as the Onion River). The trusses and structure are intact; the original deck has been replaced. Queenpost trusses; 70 feet long. Location: W. off Route 12 on Cox Brook Road. The turnoff is to the west, at the main intersection in Northfield Falls, then 0.2 miles down Cox Brook Road. Travel across Station Bridge and the bridge is visible. The Lower Bridge, built about 1872, carries Cox Brook Road over Cox Brook. This is the only location where one historic covered bridge in Vermont can been seen from another; from the Lower Bridge you can see the Station Bridge, which is just down the road. This bridge is also known as the Newell and Second Bridge. Queenpost truss; 55 feet long. Good parking area near the bridge on south side of Cox Brook Road. Location: W. off Route 110. Travel 0.8 miles southwest of Tunbridge Village center on Route 110; then 0.2 miles right on Ward Hill Road. The Cilley Bridge, built in 1883, carries Ward Hill Road over the First Branch of the White River. Multiple kingpost truss; 66 feet long. Parking on either side of the bridge. Location: E. off Route 131. Travel 2.4 miles east of the junction of Route 106 on Route 131; then 0.1 mile left on old section of Route 131 on Henry Gould Rd. The Salmond Bridge, built about 1875, carries Henry Gould Road over the Black River. This bridge was moved to its current location in 1986. Multiple kingpost truss; 53 foot long. Parking for the picnic area also serves a parking for bridge viewers. The Martin Bridge, built in 1890, crosses the Winooski River. A private bridge, first it was named the Martin Bridge, and was later renamed the Orton Barn after the Orton family bought the property. It is now called the Martin Bridge again. Queenpost truss construction; 45 feet long. Traffic on the bridge is prohibited. Location: W. off Route 12 on Cox Brook Road. The turnoff is to the west, at the main intersection in Northfield Falls, then 0.4 miles down Cox Brook Road. Cross Station and Lower Bridge and the bridge is visible. The Upper Bridge, built about 1872, carries Cox Brook Road over Cox Brook. This bridge is only 0.2 miles from the Lower Bridge and 0.4 miles from the Station Bridge on the same road. This bridge is also known as the Third Bridge. Queenpost truss; 51 feet long. Good parking area near the bridge on south side of Cox Brook Road. Location: W. off Route 110 in village. Travel 0.1 miles west of Route 110 and Tunbridge Village center on Howe Lane. The Mill Bridge, built in 1883, carries Spring Road over the First Branch of the White River. An ice jam destroyed the bridge on March 4, 1999, and the bridge was replaced in 2000. Multiple kingpost truss; 72 feet long. Parking on either side of the bridge. Location: S. off Route 106. Travel 0.3 miles south of the junction of Route 131 on Route 106; then 0.1 mile left, on a farm, across the street from Weathersfield Elementary School. Bridge is visible from highway. The Titcomb or Stoughton Bridge, built about 1880, carries a foot trail on a farm over the Schoolhouse Brook. Multiple kingpost truss; 48 feet long. Parking in school parking lot. Robbins Nest Bridge, which was built in 1965, replaces an earlier bridge that was lost to a flood in 1927. It crossed the Jail Branch. It is queenpost truss construction; 48 feet long. The bridge is private property and a driveway. Location: W. off Route 12A on Stony Brook Road. Travel 1.6 miles from the junction of Route 12 and Route 12A, then turn right on Stony Brook Road and travel 0.2 miles. Take a left, bridge is 0.7 miles. The Moseley Bridge, built in 1899, carries Stony Brook Road over Stony Brook. During a reconstruction in 1971 steel girders were added. Kingpost truss; 39 feet long. Good parking area near the bridge on north side of Stony Brook Road. Location: Old Pittsford, Proctor Road. Travel 1.1 miles northwest of the junction of Route 3 on US7 then left at the second turn on Elm Street; then 1.2 miles to the bridge. The Cooley Bridge, built in 1849 by Nicholas Powers, carries Elm Street over the Furnace Brook. Town lattice truss; 53 feet long. Parking in pulloff near bridge. Location: 1.7 miles south of Route 66 on Route 14, then 0.1 miles left on Hyde Road. 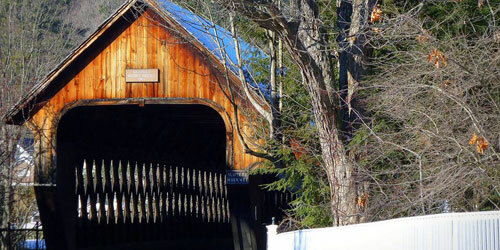 The Gifford Bridge was built in 1904 and is one of the newest of the historic covered bridges in Vermont. It carries Hyde Road over the Second Branch of the White River in East Randolph. Multiple kingpost truss; 46 feet long. Parking on either side of the bridge. Location: 1.1 miles north of junction US4 on Route 12; then 1.7 miles right on South Pomfret-Woodstock Road and walk 0.1 left on farm access. Farm is posted for privacy. The Smith Bridge carries a private road over Mill Brook. This bridge was moved to its current location in 1973 when a bridge from Lamoille County was cut in half. The other half of this bridge was on the site of the Twigg-Smith Bridge in Brownsville. The Twigg-Smith Bridge was removed in 2001. Town lattice truss; 39 feet long. Park along road, property is posted for privacy. The Brown Bridge was built in 1880 by Nicholas Powers, who was famous for constructing these bridges. It carries Upper Cold River Road over the Cold River. Town lattice truss; 118 feet long. Parking in pulloff near bridge. Location: 2.4 miles northwest of junction of US5 on Route 132; then 0.5 miles right and just right on Academy Road. The Union Village Bridge, built in 1867, carries Academy Road over the Ompompanoosuc River. Town lattice truss; 111 feet long. Parking on the road before crossing the bridge. Location: Off Route 44. Travel 1.1 west of main intersection in Brownsville on Route 44; then 0.2 right and 0.1 right on Bible Hill Road. The Bowers Bridge, built in 1919, carries Bible Hill Road over the Mill Brook in Brownsville. Tied arch; 45 feet long. Parking along the road. Location: 1.3 miles north of the junction of Route 4 east on US7 in Rutland then 0.8 mile right and ahead on East Pittsford Road to the bridge on the east side of the road. The Twin Bridge, built in 1850, is on dry land and is not being used as a bridge. Originally a town lattice truss; 63 feet long. Parking available in town storage area near bridge. Location: S. off Route 113A. Travel 2.2 miles northwest of junction I-91 on Route 113 (Exit 14); then 0.2 miles left on Tucker Hill Road. The Sayers Bridge carries Tucker Hill Road over the Ompompanoosuc River. Town lattice truss; 127 feet long. Parking is available on the south side of bridge. Location: 1.3 miles southeast of the junction of Route 106 on Route 44; then 0.1 mile right on Churchill Road. The Best Bridge, built in 1889, carries Churchill Road over the Mill Brook. Tied arch; 37 feet long. Roadside parking.